Recharge portable devices anytime, anywhere. Contains car and wall socket points for charging USB devices. Keep those iPhones, cameras, game consoles, DVD players running while travelling - no computer required! 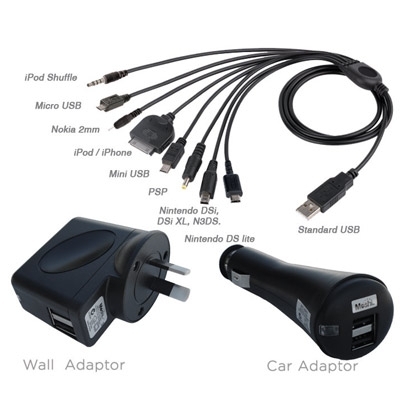 Both USB Wall Charger & USB Car Charger have two USB ports allowing recharge of multiple devices at the same time. Both USB ports on both adaptors output at 1000mA for fast charging performance & the ability to charge devices most adaptors can't. Pack includes a multi-adaptor charge cable with connections to suit but not limited to. Nintendo DSi & DSlite, Sony PSP, Apple iPod & iPhone 2G, 3G, 3GS & 4. Don't get caught flat again! Dual Port USB AC wall adaptor. Dual Port USB car adaptor. USB 8 in 1 multi-cable.